It is possible to cover the birding sites for the endemic birds of Amami and Okinawa in only a few days, essentially following the directions in Brazil’s book. We did not see Amami Woodcock or “Amami Thrush”, or the Amami Black Rabbit – all of which have been reported to have been decimated by the introduction of mongoose on Amami to control the endemic Habu-Habu snake. The woodcock and thrush may still be “findable” but probably at another site. The other endemics were found in the expected locations. A trip to the Ryukyu Islands starts with the understanding that there are only a few birds to be found here that cannot be found elsewhere, but that these are very special endemics and that several are possible to see in a relatively short period. It is also going to be an expensive trip, regardless of the planning, simply because it is Japan. A rental car, hotel, and food are all going to be expensive with few bargain alternatives. We happened to schedule this trip at the end of the Japanese holiday of Golden Week, which could have been a problem because this is the busiest vacation travel time in Japan. However, with the help of a Japanese-speaking friend, we were able to secure hotel reservations, and car reservations were made through Hertz (who use Toyota as their local agent). We had made our flight reservations early, but surprisingly our flights were not full, possibly because we were traveling in the middle and not at the end of the holiday period. The key reference for this trip is Brazil’s book on where to watch birds in Japan. His directions, information, and maps are still relevant. In Amami, there were no English-language maps available at all so his map allowed us to cross-reference the birding locations onto the local maps. All of the phone numbers, etc., are also still accurate as far as we know; I have included those we specifically used in this report. We used the Japanese version of the Wild Bird Society of Japan bird guide which has illustrations of the endemics and most Japanese birds with scientific names for reference. In Amami there are many hotels in the main city of Naze, which is about an hour’s ride from the airport. The birding sites are very close to the city. Naze has several convenience stores and restaurants. The Joyfull restaurants had a western menu at excellent prices. Just outside of Naze, on the eastern side of the tunnel leading to the airport, is an excellent department store with a wide variety of items – we bought a high-power torch there. We stayed at the Amami Seaside Hotel, primarily because it had a vacancy – this was during the busy Golden Week period so we took the first available room after several others were sold out. Okinawa is much more Westernized than Amami, but Hentona is well out in the countryside and there is little English spoken or written. To find a hotel or restaurant, we found it to be useful to note its phone number, as these are often written on the buildings. The new Okinawa Highway is a tollway that leads from Naha city to Nago and it is another 30 minutes drive north to Hentona. The birding sites are about 30 minutes from Hentona up Route 2. We stayed at the Hotel Miyashiro that was recommended by Brazil and others; the room was OK but no one there spoke English. A truly luxurious hotel a bit further south is the 5-star JAL Private Resort Okuma, which also has several nice restaurants which, despite the “Private” name of the resort, are open to the public. In Naha on our last night we stayed at a very nice Japanese-oriented hotel right on the main road downtown – there are many options available. 24-hour Internet cafes are located downtown as part of computer game centers. Unfortunately, this level of awareness does not seem to have helped the Amami Woodcock or Amami Black Rabbit, and areas not far from the Okinawa Woodpecker stronghold are being clear-cut. Ruddy Kingfisher illustrations are also widespread on both islands; it would not be surprising if most residents saw this bird, because we saw one right in downtown Naze in Amami, and heard them almost everywhere on both islands. It appears that it is necessary to change foreign currency to yen at a major airport or to find an ATM at a bank or airport. ATMs at convenience stores we tried no longer accepted Western ATM bank cards, only special Japanese bank cards. The small hotels in Hentona do not take credit cards. Taxis in Tokyo do (which is good because they are very expensive). An International Drivers License is required by law to rent a car in Japan; Internet services as well as AAA in the USA can provide one. The Toyota cars we rented had a GPS map display that was very helpful even though it was in Japanese. Other reports have mentioned that renting a car in Amami upon arrival at the airport was easy; we found it would have been impossible and would recommend a pre-booking. We caught an early direct JAL flight from Tokyo (Haneda airport) to Amami Island, arriving just before noon. We had pre-arranged a rental car with Hertz who use Toyota Rent-a-car as their local agent in Japan, but had problems upon arrival. Oddly enough, no one at the information desk spoke English. Luckily, a Japanese tourist who spoke English overheard us and kindly translated and eventually we determined we had to go into downtown Naze, a 50-minute bus ride away, to get our car. By then, the bus which had come to meet our incoming flight had left and the next bus was not scheduled for over an hour later, but the other option was a taxi for 4000+ yen so we waited an hour for the next bus. It was early afternoon so no birding time lost. There were no tourist maps with any English at all on them, but we were able to cross-reference the maps in Brazil’s book and some Internet maps with the local tourist maps to get around with no problems – Amami is not a big place. When we did reach the Toyota/Hertz pick-up location in Naze, everything went smoothly. After an uneventful check-in at the modest hotel, we picked up some take-out food for our supper (and some donuts for the next morning’s breakfast) and drove out to the Supa-rindo road to look at it in the day in preparation for our evening woodcock run. It was in good condition with only a few potholes, but we did not see many obvious swampy areas near the road as potential woodcock sites except well down the road past Kinsaku-baru. We had a brief flyover of Lidth’s Jays which gave us the call for later reference. Several Ruddy Kingfishers were calling about 5 to 6PM near the Kinsaku-baru junction but we did not see any – in fact, despite hearing them constantly around dusk we never did see one well in Amami. After dusk we drove back and forth along the length of the road three times, stopping at the likely spots we had noted during an afternoon reconnaissance, but no sign of any woodcock. There were many calling Ryukyu Scops-owls all along the road. But there was no animal life at all – not even any of the Amami black rabbits, which are said to be “plentiful”. We returned to the hotel about midnight. We went back out to the Supa-rindo road about an hour before dawn, and made one complete pass before dawn, again with no sign of a woodcock or anything else. At dawn Ryukyu Robins were calling loudly beyond Kinsaku-baru and responded vigorously to tape playback, affording point-blank views. This bird is a real stunner. We spent the rest of the day trying various locations for possible Amami Thrush with no success. We were not certain we even heard any calls. During the day we had flyover Ryukyu Minivets and puzzled over the unusual coloration of the local owstoni race of Narcissus Flycatcher. We also had some perched views of Lidth’s Jays at Kinsaku-baru. At about 4PM, White-backed Woodpeckers began their loud drumming and we were able to view several around the Kinsaku-baru junction area. This is the dark-backed race. Ruddy Kingfishers and Ryukyu Scops-owls were again calling at dusk, and we flushed one owl from the road as we drove down for supper. After supper we made a few more passes along the Supa-rindo road trying for woodcock from 9 to 11PM, with no success (and again, saw nothing else), then returned to the hotel. We slept in a bit after deciding there were no obvious new places to look for the woodcock. Departed Amami at 11:35AM and took a connecting flight to Okinawa, arriving at 14:20. Here everything went very smoothly as we picked up our car and drove up to Hentona via the Okinawa Highway, arriving at 17:30. We picked up a quick supper at the nearby Family Mart and headed up Route 2. We confirmed reports that the Fungawa Dam trail is now locked up for “terrorist alert”, and only views from the parking level are possible. We also drove around the Okuni-rindo and Terukubi-rindo tracks, looking for Okinawa Woodpecker before dark and Okinawa Rail after dark, but without success. These tracks have apparently been expanded since Brazil’s book; refer to my sketch to see where we went on our rides in this area and where we eventually saw these birds. However, in general, his directions again remain accurate. 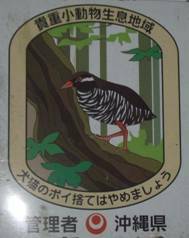 We were up early to the Okuni-rindo track to scan trees for roosting rails – no luck. 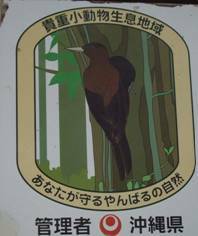 Driving around, we encountered one area, as noted on the sketch, where there were dozens of Ryukyu Robins (different race than on Amami) on the road – they very easy to see and again very stunning. At about 7AM, I thought I something that might have been a rail scamper up the side of the road but had no real view. A bit further along we stopped the car to look around, and suddenly Marlene pointed out an Okinawa Rail slowly crossing the road about 100 meters away, giving perfect views. About two minutes later, another bird followed the first in the same general area. Although we did not go any further, this road may in fact connect to the Benoki Dam area, from where Okinawa Rails have been reported. Returning back up the hill, we drove slowly around, stopping often and listening for anything like a large woodpecker, with no success. Around 11AM, we drove to the Yambaru Nature Center, to see if anyone there had any good ideas about where to find Okinawa Woodpeckers. The Center itself was closed but a staff member directed us to Ziji Falls nearby where he said the woodpeckers were found – this surprised us as we thought the bird was exclusively a higher elevation bird. Driving to the falls, the ticket-seller did show us some photos of the Okinawa Woodpecker along with a felled tree with a nest hole, convincing evidence that the birds were indeed resident here. We walked up the path to the waterfall area; we did not see any woodpeckers, but we did get a stunning view of a Ruddy Kingfisher eating a centipede that made this stop worthwhile. In the afternoon, we returned up Route 2 to the Terukubi-rindo track. At one stop, we heard a very faint tapping. Waiting quietly, we were rewarded when a male Okinawa Woodpecker flew very close, perched a few seconds and tapped a bit (quietly), then flew off, never making any call. We were very surprised, having expected a loud tapping and/or a loud call from the bird. We were quite fortunate to have seen it. In the evening, we decided to celebrate by dining at the 5-star JAL Private Resort Okuma. Upon arrival at the parking lot at 20:00, we heard the distinctive call of Northern Boobook, so we delayed our dinner plans to locate it. We found it in an isolated tree just off the road, but it flew just as we were going to spotlight it. We followed it to another roost, but it left there as well as we arrived. But we had good flight views and were pleased to have tracked it down. And then we had a great meal. So this was a very good day. Having seen all of the endemic and special birds, we decided to relocate down to Naha City via Cape Hedo (Hedo Misaki). 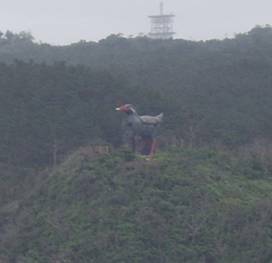 This is the northernmost point of Okinawa, and has a beautiful panoramic view of the coastline. 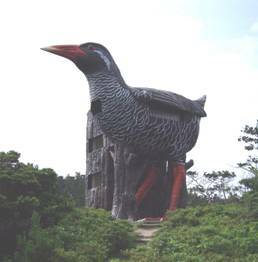 However, its truly unique feature that makes it a must-see for the birder or tourist is its 3-story tall Okinawa Rail statue. This really has to be seen in person to be properly appreciated, but I have included a photo to give an idea. I encourage anyone staying in Hentona to take the scenic hour drive up to Cape Hedo to see the coastline and the statue; it really is unforgettable. Continuing down the eastern coast, we drove down to Naha City and stayed overnight to make our morning departure the next day easier, and also to allow some e-mail access. Brief rest stops along the way gave great scenic views as well as more Ruddy Kingfisher sightings. Departure to Taiwan for Fairy Pitta – see our separate report. Perhaps the most significant comment we can offer is that, in our days of birding on Okinawa, all of the “interesting” birds were seen on the northern side of Route 2 on the Terukubi-rindo track even though we probably spent more time on the southern side of Route 2 on the Okuni-rindo tracks and the connecting tracks down to the main road. Because I do not know what the area was like previously, I cannot speculate on why this might be – and it may simply have been chance. But we would definitely recommend spending most birding time on the north side of Route 2. A Field Guide to the Birds of Japan, Wild Bird Society of Japan (in Japanese). This is available at large book stores around Tokyo Station. The English-language version is prohibitively priced at US100+, when available on EBay, etc. A Birdwatcher’s Guide to Japan, Mark Brazil, Kodansha International in cooperation with The Wild Bird Society of Japan, first edition 1987, but it is still largely accurate and really indispensable when birding in Japan. Amami Seaside Hotel, Naze: 81-997-52-5511. Bird List – not comprehensive, only specialties. Okinawa Rail, Gallirallus okinawae: three in total seen, all at a site 3.3 km beyond the junction where four roads meet along the Terukubi-rindo track, at 7AM. We were out of our car, and they slowly crossed the road about 100 meters away, giving great views. If they saw us, they did not seem bothered. We could not determine if this was a family group. This road probably continues close to the Benoki Dam, a known site for the Rails. Ryukyu Scops-owl, Otus elegans: constant calls and several views of the bird along Supa-rindo track beginning at dusk, especially farther down the track. Northern Boobook, Ninox japonica: we tracked one down after hearing its long-range call from the JAL Private Resort Okuna on Okinawa and had flight views when we flushed it. Ruddy Kingfisher, Halcyon coromanda: heard almost every day, mostly in coniferous forest but also in residential areas; not seen well on Amami except for one brief glimpse in downtown Naze. Our best look was at Ziji Falls on Okinawa. Okinawa Woodpecker, Sapheopipo noguchii: only one male seen for a few seconds, and that with a bit of luck. We read in other reports that the bird is often seen without much warning, and this was our case too. We heard a light tapping while walking along the road in late afternoon, stopped for a minute, and the bird flew into view. It tapped for several seconds on a dead tree, and flew off. That was it. White-backed Woodpecker, Dendrocopos leucotos (owstonii race? ): several seen well at the Kinsaku-baru junction, noisily tapping starting primarily at about 4PM. Japanese Pygmy Woodpecker, Dendrocopos kizuki: seen on both islands. Ryukyu Minivet, Pericrocotus tegimae: first seen as a flyover on Amami, then more commonly on Okinawa including perched on phone wires. Ryukyu Robin, Erithacus komodori: on Amami, the bird was more difficult to see, along the track beyond the Kinsaku-baru junction. However, once located, it responded aggressively to a tape playback. This form had distinctive black markings along the flanks. On Okinawa we literally had to wait for the bird to move from the road along a stretch near the Terukubi-rindo track where a side track is marked “13% grade”. That form had no black markings at all. Both birds were very active and delightful to watch. Blue-and-white Flycatcher, Cyanoptila cyanoemlana: one seen well on Okinawa. Narcissus Flycatcher, Ficedula narcissina owstonii: when we first saw this bird on Amami, we were quite puzzled because it did not look like anything we had expected – some color but still drab; then we recalled the comment in a Birdquest write-up about a drab form of Narcissus Flycatcher and decided that was what we had seen. Japanese Paradise-Flycatcher, Terpsiphone atrocaudata: a male seen at Ziji Falls on Okinawa. It is easy to watch for a long time. Lidth’s Jay, Garrulus lidhti: we first had brief flyovers while on the Supa-rindo track; the following day , once we knew the call, we tracked some down in the mist. Perhaps it was because of the overcast, but we were a bit disappointed in the dull brown and blue coloration of the two birds we saw. We were also surprised by how large they were.